Acupuncture is a form of Chinese medicine that has been used in veterinary practice for approximately 3000 years. Today, the research being performed shows that there is a scientific basis in support of the use of acupuncture in treating m any acute and chronic conditions. The American Veterinary Medical Association considers it a valid modality for treatment of pain and various disorders in animals. Acupuncture utilizes specific points on the body to affect organ systems and local pain through the nervous system. These areas/points are concentrated in nervous innervation. By activating these areas with a small sterile needle, we are able to influence the central nervous system (spinal cord and brain), which controls the internal organs, decreases inflammation, promotes circulation, and alleviates pain. Acupuncture has been shown to treat what we call “trigger points”. These trigger points can be thought of as “knots” or “spasms” in the muscles. They are painful and are commonly found along the back, poll, neck, and gluteal muscles in performance horses. Trigger points can be formed secondary to an injury and from chronic muscle use. For example, horses with osteoarthritis in their hocks often have secondary lumbar back pain. A horse like this will likely respond to hock injections, but there still may be residual back pain that can hinder performance. Needles inserted at the lumbar and distal points in this case can desensitize the trigger points to help alleviate the pain and resolve the muscle spasm to improve function and performance. Acupuncture also can be used for internal organ and nervous system disorders such as various forms of colic, photic head shakers, facial nerve paralysis, radial or suprascapular nerve damage, stomach ulcers, chronic colic, and for reproductive infertility issues. Electroacupuncture is when a low current of electricity is passed through a muscle group via needled acupuncture points. This results in increased stimulation of the points and is a more aggressive form of acupuncture. This is used when dry needling of acupuncture points is unsuccessful and/or a more aggressive treatment is warranted. Horses tend to enjoy electoacupuncture because of the high levels of endorphins that are released from the brain with electroacupuncture. Electroacupuncture at low frequencies is thought to give a longer lasting treatment. Aquapuncture is when an injection of a small amount of a sterile liquid (i.e.- vitamin B12 and/or sterile water) is placed at strategic acupuncture points. This is thought to promote long lasting affects of the acupuncture. 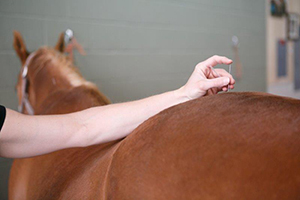 This form of acupuncture is useful in horses that do not enjoy acupuncture sessions. “Moxa” is a Chinese herb called Artemisia vulgaris, that when burned is used to warm the needles that are in acupuncture points. This warmth stimulates the acupuncture points and warms the muscle. This technique is commonly used in horses’ backs during the winter or in conditions that worsen with colder weather. 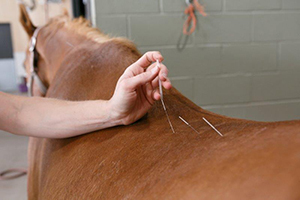 Acupuncture can be very rewarding for performance horses and their owners. Chronic pain can be frustrating to manage and acupuncture gives us another alternative for its management. 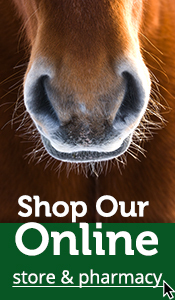 If you have any questions about acupuncture and your horse please feel free to contact us!